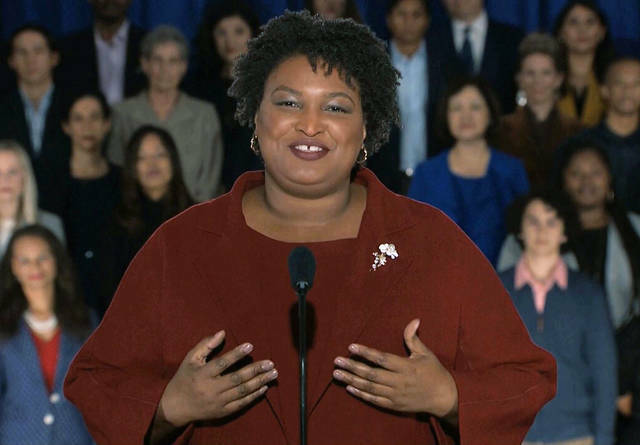 Claim: Stacey Abrams gave the State of the Union response in front of a green screen showing fake supporters. The facts: Abrams, who ran for governor of Georgia last year, did not stand before a green screen to give the Democratic rebuttal to President Donald Trump’s State of the Union address Tuesday. The claim circulated widely on social media, with comments suggesting she lacked an audience of supporters. Abrams held her address at the International Brotherhood of Electrical Workers Local 613 in Atlanta, said Caitlin Highland, spokeswoman for Abrams’ campaign. Abrams had more than 35 people standing behind her throughout the speech and about 40 more watching from the sidelines. The audience included activists, doctors and elected leaders, Highland said. The Associated Press confirmed the crowd with news footage from the event and photos provided by her campaign, which gave a behind-the-scenes look at who attended her speech. On the night of the event, the AP was also provided with pool photos and video of her speech. The pool photos and video show the same people pictured in the campaign’s behind-the-scenes photos and video. Claim: Ruth Bader Ginsburg did not attend concert because there are no photos to prove it. 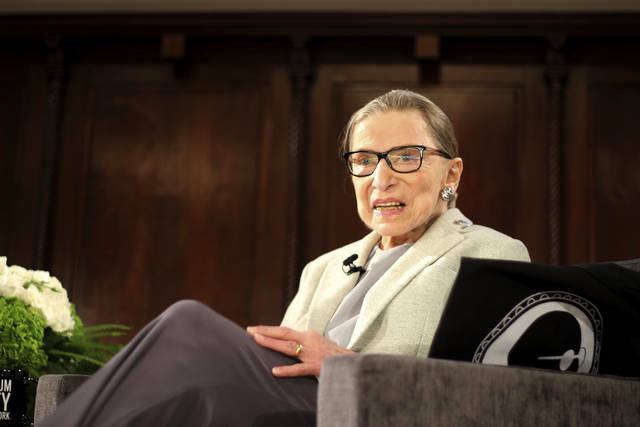 The facts: Supreme Court Justice Ruth Bader Ginsburg made her first public appearance in weeks on Monday, however photography was not permitted at the event. The AP reported that Ginsburg on Monday attended “Notorious RBG in Song,” a concert in her honor presented by the National Constitution Center in Washington. Ginsburg was seated in the back of the darkened auditorium at the National Museum of Women in the Arts, according to the AP and other media outlets in attendance. Since the event, posts on social media have insinuated falsely that she did not attend the concert, citing the lack of photos. And in recent weeks, posts questioning the health of the 85-year-old justice have circulated widely on social media, with some suggesting she died after undergoing cancer surgery in December. Most of the reports surfaced after she missed oral arguments in January for the first time in 25 years. Other social media users pointed to Ginsburg’s absence at President Donald Trump’s State of the Union address Tuesday, however Ginsburg also skipped last year’s State of the Union address. Justices Stephen Breyer, Sonia Sotomayor, Clarence Thomas and Samuel Alito also did not attend this year’s address. 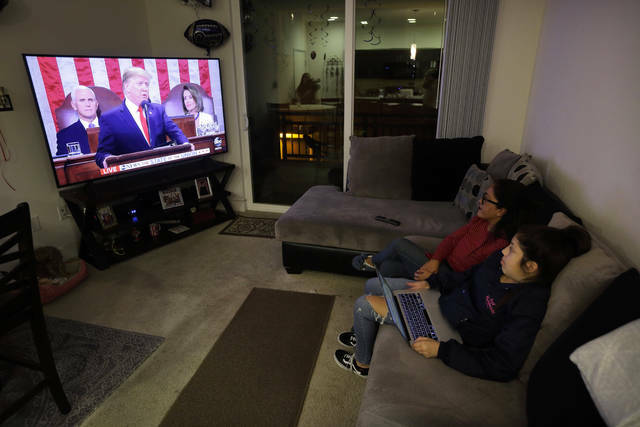 The facts: President Donald Trump’s State of the Union address did not have more viewers than this year’s Super Bowl despite reports circulating widely on Twitter and Facebook. The New England Patriots win over the Los Angeles Rams on Sunday attracted 98.2 million television viewers, according to the analytics company Nielsen. It aired only on CBS. Figures released Friday show viewership outside the home — in bars, restaurants, hotels and office — added 12 million more viewers to that total, making up roughly 10 percent of overall viewership. While typically the most watched program of the year, Super Bowl viewership was down 5 million viewers this year compared to last year. Meanwhile, Nielsen reported 46.8 million people tuned in to Trump’s national address on Tuesday. The speech aired on multiple cable and prime time networks. Nielsen has not yet reported out of home viewership for the speech, but the largest viewership in the last 17 years was 51.7 million who watched President George W. Bush’s 2002 address. Trump had a larger audience for his address this year than last, when 45.6 million watched. Nielsen’s estimates do not include viewers on streaming services. This is part of The Associated Press’ ongoing effort to fact-check misinformation that is shared widely online.